For some of our patients, having straighter teeth is their #1 goal to achieving a great smile. Straighter teeth not only look better, they are easier to care for in terms of flossing & brushing. Also, there is less wear on straight teeth over time because of how they align with other teeth from top to bottom. So investing in a comfortable bite, a relaxed jaw, and better looking straight teeth is an investment in your future health. Dr. Syme is able to provide you with Invisalign to straighten your teeth. Gone are the days of the mouth full of metal braces. 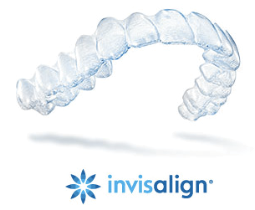 Invisalign is an almost invisible, detachable aligner which straightens your teeth, and which can manage overbite and under bite as well. We will make your clear aligners by using 3D computer imaging technology to slowly guide your teeth back to their proper location. Because Invisalign is a clear plastic aligner, there are no metal wires to catch on lips or gums, or to trap food. During your consultation with Dr. Syme, she can help you decide if Invisalign is the right option for straightening your teeth and achieving better long term health for your teeth, your bite and your smile. Your Invisalign treatment plan would begin with a 3D scan of your teeth to create the customized aligners which fit over your teeth. We would replace these aligners every two weeks as your teeth slowly move and are re-positioned into a new place. You will need to wear your aligners full time except during eating and drinking for 1 to 2 years.